Kathakali : is one of the oldest theatre forms in the world.Kerala owes its transnational fame to this nearly 300 year old classical dance form which combines facets of ballet, opera, masque and the pantomime.Kathakali was born only in the 17th century but in less than four centuries it grew up to represent India's cultural heritage to the world outsideThis elaborate art form is usually performed in the evenings and continues up to dawn, and is an integral part of all temple and cultural festivals in kerala. The costumes and makeup are ornamental, elaborate and designed to give a superhuman effect. The actors do not speak or sing but enact the story through mudras (hand gestures) graceful movements and facial expressions.One of the most interesting aspects of Kathakali is its elaborate make-up code. Music is an essential feature of kathakali,with two vocalists who sing to the accompaniment of a chengila ,elathalam,chenda and maddalam . Kathakali is a group presentation in which dancers take various roles in performances traditionally based on themes from india's rich and colourful Hindu mythology, especially the two epics,the Ramayana and the Mahabharata.Characters are categorized according to their nature.The technique of Kathakali includes a highly developed language of gesture, through which the artist can convey whole sentences and stories . Kathakali make-up and costuming is intricate, elaborate and colorful.It takes about three hours for an actor to transform into a full-fledged character with facial make-up, head-gear, ornaments and colorful costumes . Mohiniyattom : There is no precise historical evidence to establish the antiquity of Mohiniyatttam, the classical female dance-tradition of Kerala. Probably it was evolved in the seventeenth century. The sinuous dance of the enchantress, this is a distinctive classical dance form of Kerala. Slow, graceful, swaying movements of the body and limbs and highly emotive eye and hand gestures are unique. Mohiniyaattam was specially created for female dancers. This dance-form was different from the other performing arts of Kerala mainly in two respects. Firstly, the dominantly religious atmosphere of the other classical dance-styles is absent in Mohiniyaattam. Secondly, it did not flourish in temple-precincts like Bharathanatyam Odissi, or Kuchipudi. Thullal: Thullal is a considerably simplified single-actor performing art that enjoyed much more popular appeal than Kathakali, the so called ‘total theatre’. Kunchan Nambiar who lived in the 18th century composed dozens of tullal stories, adding to the literature of the local language, Malayalam, a new genre which consisted of narrative poetry replete with social criticism surcharged with pungent satire and sarcasm. These compositions were singularly suitable for presentation on the stage attracting even the unsophisticated illiterate through highly rhythmic recitation enlivened by closely accompanying percussion instruments and agile dance involving mono-act.Thullal has three varieties - Seethankan,Ottan and Parayan.The distinction between them lies mostly in the make-up and costumes and to some extent in the metres and the rhythm used. Thullal often reflects the literary, artistic and cultural life of the medieval Kerala . Chavittunatakom : A Christian art form of Kerala. Evolved at the turn of the 16th Century AD during the Portuguese colonization and bears definite traces of the European Christian Miracle Play. Koodiyattam : Koodiyattam is perhaps the oldest dance drama form still in existence in India. Koodiyattam literally means dancing together. Based on the Sanskrit text, a performance of this art form may last from a few days to a few weeks.literally means "acting together". This, the earliest classical dramatic art form of Kerala. has been recognised by UNESCO as a Human Heritage Art. Rightly so. 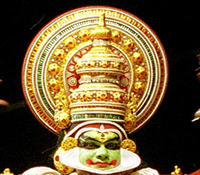 It is the oldest existing classical theatre form in the entire world, having originated much before Kathakali and most other theatrical forms based on Sage Bharatha's 'Natyasasthra' of the second century.The costumes in Koodiyattom vary according to the characters. The traditional rhythm accompaniment is on mizhavu. The ecstatic drumming on this primordial percussion instrument helps the Chakkyar to delineate the myriad moods as demanded by the play. The Chakkyar performs the role of the male characters. Female characters are portrayed by Nangiars, the women folk of the Nambiar community. They also assist the Chakyars in background singing and in keeping the rhythm with kuzhithalam (small cymbals). 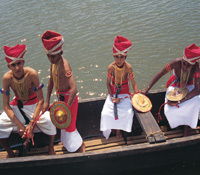 The costumes in Koodiyattom vary according to the characters Today, performing artistes among the Chakyars have been reduced to an endangered species. Ammaur Chachu Chakyar, Paimkulam Rama Chakyar, Padmasree Mani Madhava Chakyar are great exponents of this ancient theatrical art form. Chachu Chakyar Smaraka Gurukulam at Irinjalakuda is imparting training on this ancient art form. Koodiyattom is performed only at a few temples of Kerala such as at Irinjalakuda, Kottiyur etc. 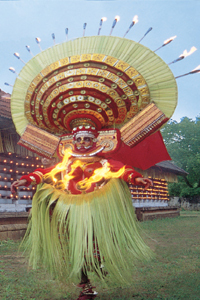 Theyyam: is one of the most outstanding ancient dance form of Kerala. The word 'Theyyam' originated from 'Daivam' means nothing but God. It is a very fascinating ritual practised for centuries by the tribal people and the villagers of Northern Kerala. This folk art form is also called Thirayattam, because every thira or village performed this ritualistic art at the village temple.The Theyyam or Kolam (a form or shape), represents a mythological, divine or heroic character. There are over 400Theyyams in northern Kerala. It is a dance form glorifying the Theyyam, the local deity, who is believed to bless and arbitrate between the farmers and their landlords. This primitive ritualistic art demands long hours of preparation before the performance. The bizarre head dresses, costumes and body painting and trance like performances are very extraordinary. Each one has a distinguishing headgear and costume made out of natural materials like coconut leaves and bark. Musical accompaniments are chenda and veekuchenda (drums), elathalam and kuzhal (horn). Theyyam is always performed by men. Female roles are also enacted by men wearing suitable makeup and colourful costumes.During the festival season between January and April, Theyyam performances can be seen in the villages in the erst-while Malabar region, especially in the Kannur District. There are regular Theyyam performances at Sri Muthappan Temple in Parassinikadavu, which is some 20 km north-east of Kannur town. Patayani : is a week- long ritual dance, held in Kaali temples on the banks of the Pamba river during the Malayalam months of Meenam and Medam (March - April). Mudiyettu : is a ritual dance performed in some Kaali temples of Ernakulam and Kottayam districts (central Kerala). The dance celebrates the goddess's triumph over the demon Daarikan. 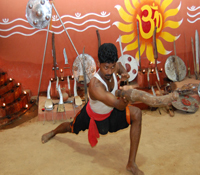 Kalarippayatt : is the traditional martial art of Kerala. It is believed to be the forerunner of all eastern martial arts . 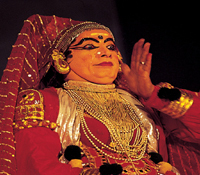 It has played a significant role in the technical development of all other performing arts in Kerala. Its roots can be traced back to the 12th century when skirmishes among the many feudal principalities were very common. 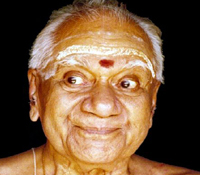 Masters of Kalarippayatt are called GURUKKAL. Kalarippayatt is taught inside a special arena called KALARI, which is part school, part gymnasium and part temple. A kalari is constructed following traditional principles. Its rectangular design is always aligned east - west direction and Hindu deities are represented at each corner.Training in Kalarippayatt begins at a very young age. Learning requires ritual stretching and flexing exercises to achieve balance and concentration. To increase suppleness of limbs, a full body massage is given. During the course of the training, various weapons are introduced including the sword and shield of the medieval warrior .